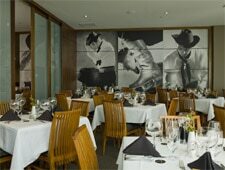 THIS ESTABLISHMENT IS CLOSED Gaucho-garbed guys and the churrascaria tradition with Brazil-moderne décor--that's Chima. : THIS ESTABLISHMENT IS CLOSED In the bar, cowhide cubes and pedestal seating surrounded by lamps bearing black shades---all from Brazil---set the tone for this remake of a churrascaria. On the salad bar, corn and blue-cheese mousses set a different tone for the offerings, which include classic Russian salad, grilled eggplant and thumb-thick asparagus among the assorted dishes. The lamb sausage is the first of the numerous offered meats to look for, and be sure to have it with the very good mashed spuds. Then comes a raft of selections on skewers, as patrons turn their disks over to green, indicating they are ready to be served. The picanha is the best of the lot, especially if you can get it rare. For dessert, after all that meat indulgence, the mango cream is the lightest while supplying lovely flavors.